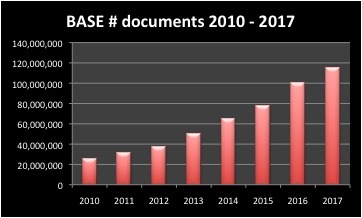 In brief: best guesstimate - there are approximately 70 million OA documents today (subset of BASE's 115 million, about 60% OA), with OA documents at BASE growing at a rate of about 1,800 OA documents per day. 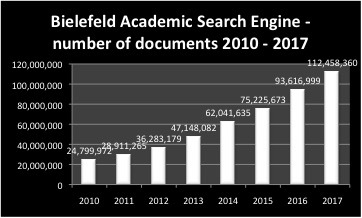 Where do these come from? 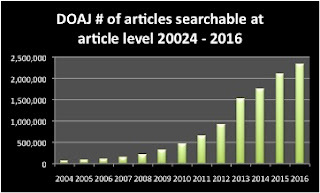 Thousands of OA archives - with PubMedCentral the largest by far at 4.5 million articles and active participation by thousands of journals. This quarter by the numbers the DOAJ team set a new record with a net growth of 689 journals of 7.7 titles per day. 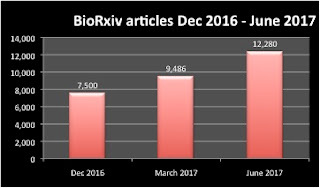 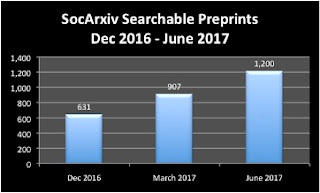 However, percentage wise the most remarkable quarterly growth was all about archives, with BioRxiv and SocRXiv topping the growth list by percentage, and as usual several sections of Internet Archive well up on the growth list. 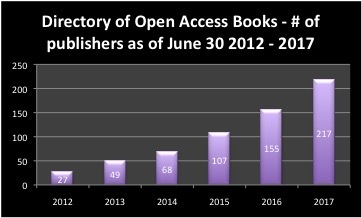 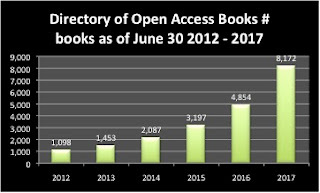 On an annual basis, Directory of Open Access Books was the fastest growing in terms of both # of books and # of publishers.